​This standing Nativity ​plaque is carved in a triptych style (three panels that are hinged together). The wood is aromatic camphor wood. Three wise men are on the left panel. Three shepherds are on the right panel. The center panel shows the Holy Family with an angel behind them. The Chinese characters written on both pillars are Isaiah 9:2, which reads, “The people that walked in darkness have seen a great light: those who lived in a land of deep darkness, upon them hath the light shined.” This scripture is a beautiful prophecy of the coming of Christ. The characters on the left side of the Nativity are the first part of the scripture up to the colon, and the rest of the scripture is on the right side. The item is 7.5 inches tall x 10.5 inches wide. 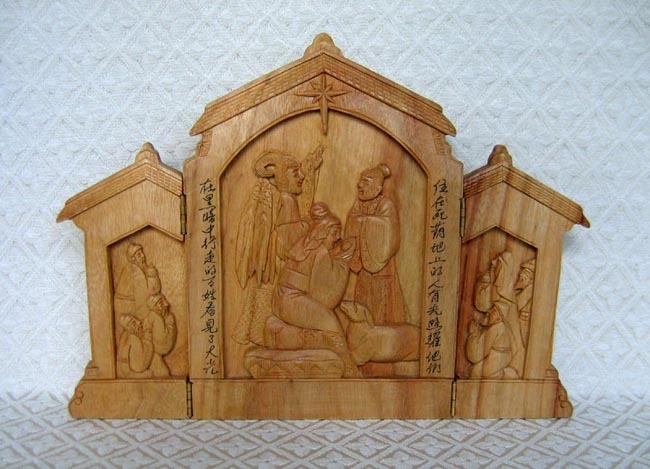 This item comes from the only Christian woodcarving workshop in China, located in the Zhejiang province, an area famous for all types of wood carving.